Shiny Charizard in game: 357 Who? Important notice! Pokemon Shiny Charizard is a fictional character of humans. Charizard (Japanese: ??—?? 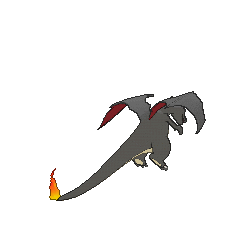 Lizardon) is a dual-type Fire/Flying Pokémon introduced in Generation I. It evolves from Charmeleon starting at level 36. It is the final form of Charmander. 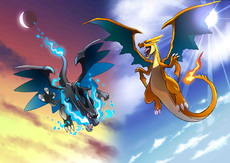 It can Mega Evolve into two forms: Mega Charizard X using Charizardite X and Mega Charizard Y using Charizardite Y.
Charizard is the game mascot of Pokémon Red and FireRed Versions. Mega Charizard X and Mega Charizard Y. As Mega Charizard X, its body and legs appear more physically fit, though its arms remain thin. Its skin turns black with a sky blue underside extending from the lower jaw to the tip of the tail. Two spikes with blue tips curve upward from the front and back of each shoulder, while the tips of its horns sharpen, turn blue, and curve slightly upward. Its brow and claws are larger, its snout is shorter, and its eyes are now red with white pupils. It has two small, fin-like spikes under each horn and two more down its lower neck. The lower trims of its wings are divided into large, rounded points and each third joint is adorned with a claw-like spike. 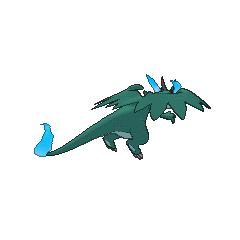 Mega Charizard X breathes blue flames out the sides of its mouth, and the flame on its tail now burns blue with increased heat. 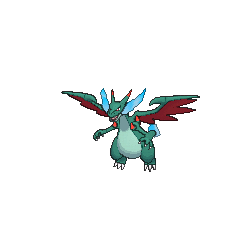 When Mega Evolved as Mega Charizard Y, this Pokémon becomes more sleek and expansive in appearance, but retains its normal coloration. However, it now has white pupils. It has three pointed horns on the back of its head, the middle of which is longer. Its shorter snout has larger fangs and a ridge on the nose. Its neck is shorter and its hands are much smaller, but its torso and legs are longer. Small wings develop on its wrists, while the ones on its back become larger and now have ragged edges. The back of its tail has a large thorn at the base and three smaller ones near the tip, which now burns with a longer flame. 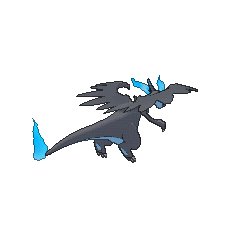 Mega Charizard Y is said to have incredible flying prowess, being able to reach incredible heights. This Pokémon flies in search of powerful opponents to battle, and its fire will burn hotter as it gains experience. Its fiery breath is capable of melting boulders, massive glaciers, and has been known to accidentally cause forest fires. In the past, Blast Burn was its signature move. Charizard typically inhabit mountains and valleys. The anime has shown that only a weak Charizard would show off its power, and that a group of Charizard resides in the Charicific Valley in Johto. Ash Ketchum has a Charizard that he obtained as a Charmander in Charmander – The Stray Pokémon. It evolved into Charmeleon in March of the Exeggutor Squad and quickly evolved again into Charizard in Attack of the Prehistoric Pokémon, where Charizard reluctantly saved Ash from the claws of an Aerodactyl. Liza of the Charicific Valley owns her own Charizard, called Charla. It has a romantic relationship with Ash's Charizard. The Charizard from Team A.C.T. and its teammates had a cameo in Pokémon Mystery Dungeon: Team Go-Getters Out of the Gate!. They were considered for the job of rescuing Big Brother Pikachu, but were already on another mission. A Charizard that can Mega Evolve into Mega Charizard X appeared in the XY series under the ownership of Alain, a Pokémon Trainer that seeks to defeat all Mega Evolved Pokémon. Trevor has a Charizard that he received as a Charmander from Professor Sycamore. It was shown in A League of His Own! to be able to Mega Evolve into Mega Charizard Y. This was the only time Charizard's Y Mega Evolution has appeared in the anime. A Charizard borrowed from Battle Park was used by Jessie in a battle against Ash's Totodile as part of an elaborate plan to capture Pikachu in One Trick Phony!. In Those Darn Electabuzz!, Casey had to help Corey Demario and his Charizard named Don get their fighting spirit back so that Corey could start pitching for The Electabuzz Baseball Team. Clark used a Charizard and Quilava against Ash's Grovyle and Glalie in Shocks and Bonds. Clark's Charizard defeated Ash's Grovyle and lost to Ash's Glalie. In Grating Spaces, Delibird gave Jessie and James a Charizard and an Aggron, with Jessie getting Charizard and James getting Aggron. However, Delibird took the two Pokémon away at the end of the episode as they were meant for Cassidy and Butch. A Poké Ride Charizard appeared in Alola to New Adventure!, under the ownership of Kiawe. Charizard first appeared in Island of the Giant Pokémon, but it was actually a robot. A real Charizard made its debut in a flashback in Primeape Goes Bananas. When James was in the Pokémon League Entrance Exam in The Ultimate Test, he used a Charizard that he eventually tried to steal. A Charizard was seen on TV in The Breeding Center Secret. Ash's Noctowl hypnotized an attacking Fearow into seeing it as a Charizard in Carrying On!. Vitzo fantasized about a Charizard in The Screen Actor's Guilt. A Charizard under the ownership of a Coordinator appeared in Come What May! participating in the Fallarbor Contest. A Charizard appeared in the opening of Destiny Deoxys. Multiple Charizard fought in the feuding armies in Lucario and the Mystery of Mew. A Charizard appeared in Alexa's magazine in The Journalist from Another Region!. Another Charizard that can Mega Evolve appeared in Mega Evolution Special I. Unlike Alain's Charizard, this Charizard can Mega Evolve into Mega Charizard Y. 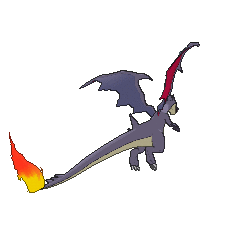 A Charizard appeared in SM003, as a silhouette. EP105 Dragon Rage Ash's Pokédex Rage, one of Charizard's most powerful attacks. Rage attack usually has a devastating effect on its opponents. EP248 Charizard Ash's Pokédex Charizard, the Flame Pokémon. Charizard's powerful flame can melt absolutely anything. BW116 Charizard Ash's Pokédex Charizard, the Flame Pokémon. Charizard is a Flying and Fire type. When competing in intense battles, Charizard's flame becomes more intense as well. Red obtained Charizard as a Charmander from Professor Oak when he went out on his journey. 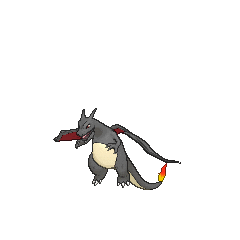 It evolved into a Charizard some time after Red defeated Koga between File 2 - Cubone and File 3 - Giovanni. During the fight against Mewtwo in File 4 - Charizard, Red's Charizard Mega Evolved into Mega Charizard X and battled Mewtwo. It was the first Mega Evolution seen in the anime. Calem's Charizard appeared in The Redemption. It was seen celebrating Calem's crowning as Champion alongside his Chesnaught. Ash's Charizard appeared in Off To The Battle Frontier! !, facing off against Noland's Articuno. 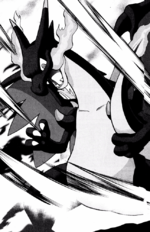 Ash's Charizard makes a few appearances in the manga series The Electric Tale of Pikachu. It first appears as a Charmander in You Gotta Have Friends and then later appears as a Charizard in The Indigo Finals. Ritchie's Charizard also appears in The Indigo Finals, battling against Ash's. Ash's Charizard has made some appearances in the manga adaptations of the movies it appeared in. Yukimura owns a Charizard which debuted in PNA6. Akira, the main character, owns a Charizard. Mori also owns a Charizard. One of Blue's main Pokémon, Charizard, debuted as a Charmander. With his increased capacity for battle both with augmented strength and his flight ability, he proved to be a valuable asset for Blue, both during the Silph Co. battles and in the Pokémon League, where Red's Venusaur narrowly defeated him. He had evolved from Charmeleon sometime before Kalling Kadabra. 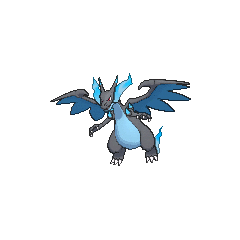 In the X & Y chapter, he has obtained a Charizardite Y, with it he can Mega Evolve into Mega Charizard Y. Another Charizard appeared in Forretress of Solitude on a poster in Red's room. A Charizard appeared as one of Pryce's ice sculptures in his gym in Irked Igglybuff and Curmudgeonly Cleffa. A Charizard was fantasied along with the other fully evolved Kanto Starters in Chinchou in Charge, where the Pokémon Association Chairman of Kanto and Johto explains to Bill and Janine the special privilege of entering the finals unconditionally after collecting the badges. 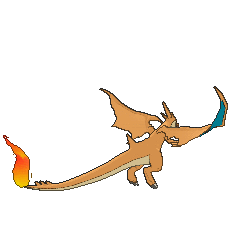 X's Charmeleon, Salamè, evolved into a Charizard during a battle against Xerosic's Pokémon in the X & Y chapter. He has a Charizardite X hidden in the flame on the tip of his tail, with it he can Mega Evolve into Mega Charizard X. In the Pokémon Battle Frontier manga series, Rald, the main character's mentor, has a Charizard. A Trainer named Nagi owns a Charizard who battled Shu and Skarmory. Lance owns a Charizard in JBA5. The Charizard from Team A.C.T. appears in the Pokémon Mystery Dungeon: Ginji's Rescue Team manga. He, along with his teammates, is a role model of Mudkip and tries to rescue him when he mistakenly believes that Ginji is a threat to Mudkip's safety. An unknown Trainer used a Charizard in PBK4. 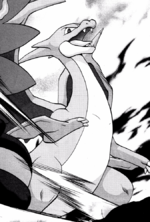 Green, the main rival of Red in the Pokémon Pocket Monsters manga series, owns a Charizard. It is the final evolved form of Charmander, his starter Pokémon. It is a mischievous Pokémon that has a rivalry with Red's Clefairy. As a Charmander, it was able to evolve directly into Charizard, apparently skipping the Charmeleon stage. It has reverted to the Charmander stage, although it has since evolved back into Charizard permanently. Another Charizard appeared in Clefairy's Golf Debut!. In Pokémon Zensho, Satoshi has a Charizard that was originally a Charmander he received from Professor Oak. Charizard's first-released TCG card, which as part of the Base Set, was widely regarded at the height of popularity of Pokémon as the best card ever. This was because of its powerful attack, Fire Spin, and useful Pokémon Power, Energy Burn, which allowed it to convert any Energy attached to it to Fire Energy. Fire Spin needed four Fire Energy and could deal 100 damage, knocking out the majority of Pokémon cards. In addition, it had the highest HP then, at 120. Individual Charizard cards were sold up to as much as $150. First edition cards of this dwarfed this price at one point breaking the $1000 US price point. This Charizard card was reprinted in Wizards of the Coast's Base Set 2 and Legendary Collection sets, and released again with updated artwork in the Stormfront expansion. One Charizard figure has been released. Charizard is a Power-type playable character in Pokkén. 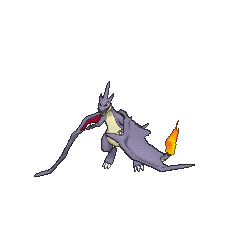 Moves it can use include Flamethrower, Fire Punch, Flare Blitz, and Seismic Toss. Upon entering Synergy Burst, it Mega-Evolves into Mega Charizard X and can use the Burst Attack Searing Blaze. Pokémon Mystery Dungeon: Charizard is a member of Team A.C.T..
51%-100% HP Leave it to me! I'll raze everything! 26%-50% HP My body's cooling down. My health is down to half. Level up I leveled up! My flame is burning even hotter now! Charizard breathes super-hot flames that melt ice and incinerate even steel. It spits blobs of fire. It also lets loose expanding rings of fire to attack. It attacks by launching fireballs as it flies around quickly. Charizard values the ancient promise in the Granite Zone. Watch him whoosh through the sky playing Salamence's Air Ace. He loves nature and the Pokémon in the Arcane Area. He wants to protect the Arcane Area. Mega Charizard X: Erases all Pokémon in an X-shaped pattern. Mega Charizard Y: Erases all Pokémon in a Y-shaped pattern. 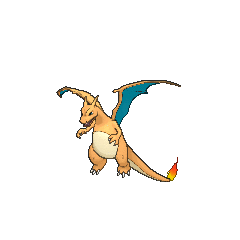 For other sprites and images, please see Charizard images on the Bulbagarden Archives. Prior to Generation VI, Charizard and Rhyhorn shared nearly the same cry. 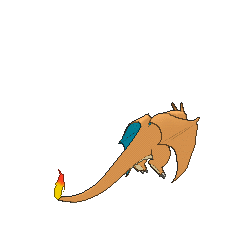 This cry was updated and reused for Mega Charizard Y.
Yellow is the only Generation I game in which Charizard can learn Fly, though it can still be traded to the older games. 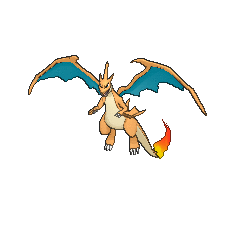 Charizard and its pre-evolution share their category name with Flareon, Moltres, and Infernape. They are all known as the Flame Pokémon. 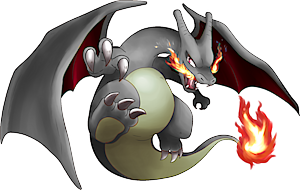 Charizard holds the distinction of being the first Pokémon to appear in the Japanese version of the Pokémon anime, as it is the first one to appear in the opening. However, outside of Japan, this honor belongs to Mewtwo. 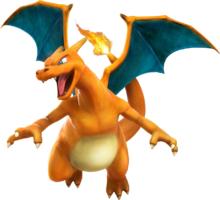 Charizard is the only Pokémon in the Super Smash Bros. series that transitioned from a Poké Ball Pokémon to a playable character. Charizard, Typhlosion, and their respective evolutionary lines have exactly the same base stats. Charizard was the focus of a Pokémon Center promotion in April 2010. 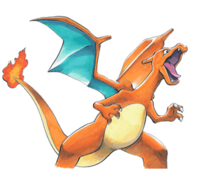 Charizard was voted as the favorite Pokémon by Official Nintendo Magazine readers in February 2012 as well as the number one Pokémon in IGN's "Top 100 Pokemon" list in late 2011. Mega Charizard Y has the highest Special Attack of all Fire-type Pokémon. Charizard was the inspiration for the naming of Chilicola charizard, a species of stem-nesting bees. Charizard is the only Pokémon not in the Alola Pokédex (and unobtainable via normal gameplay) to be a Ride Pokémon in Sun and Moon. Charizard resembles a European dragon, certainly one of many forms told and rendered in legends. 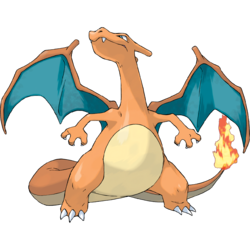 Charizard is a portmanteau of the words char (to burn) and lizard. Lizardon is a combination of lizard and either dragon or don (Ancient Greek for tooth, commonly used in dinosaur names). Cantonese Chinese ??? Panfólùhng Literally "Fire-breathing dragon"
Mandarin Chinese ??? / ??? Penhuolóng Literally "Fire-breathing dragon"